Merging journals automatically in Day One 2.0 is not supported but you can move your entries in bulk from one journal to another. Swipe on an entry and tap the Multi-Select Tool (checkmark icon). This will invoke select mode, and a circle will appear beside each entry. Tap the circle by each entry you wish to move. Alternatively, you can tap Select All to include all entries. Tap the folder icon with the arrow to choose a journal. In the journal picker that appears, select the journal you wish to move your entries to. Display the journal pane by clicking its icon. Select the entries you want to move to a journal. Drag and drop them on the desired journal in the journal pane. -OR- Right-click and select Move > Then select Journal. Tap Settings (gear icon in the top-right corner of the screen). Tap the journal you wish to delete. 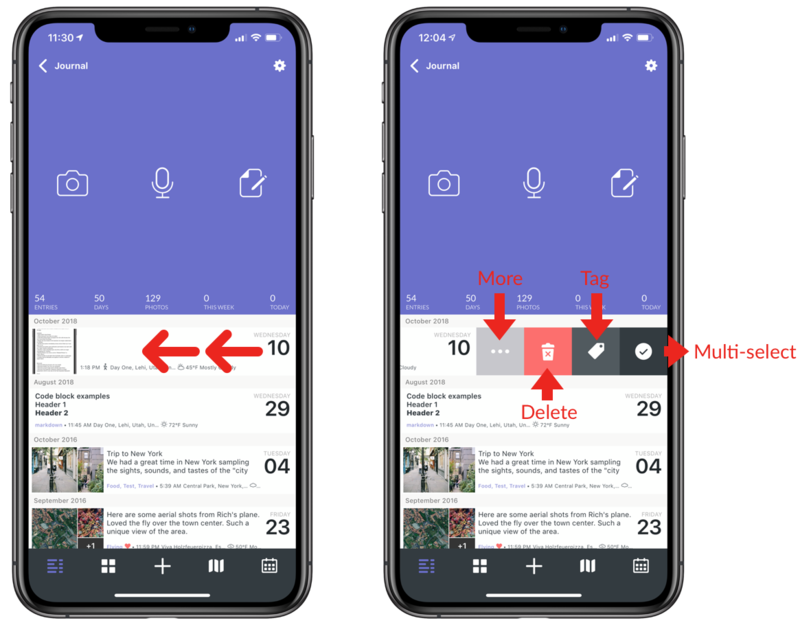 Tap Delete Journal, then tap the Delete Journal button that appears. Go to Day One > Preferences. Select the journal you wish to delete.